Yulupa Cohousing is a 29-unit urban-infill cohousing community in Santa Rosa, California, an hour north of San Francisco in beautiful Sonoma County. We moved in in July 2005. We frequently have turnover, so contact us if you're looking to buy or rent in this area. (Units include studios, one, two and three bedrooms, and one large four-bedroom high rise unit!). These values are manifested through social and work activities, shared meals, encouraging creative expression, committee participation, consensus decision-making and open hearts. We seek to provide mutual support, inspiration, warmth, and openness to each member in a way that nourishes many generations. 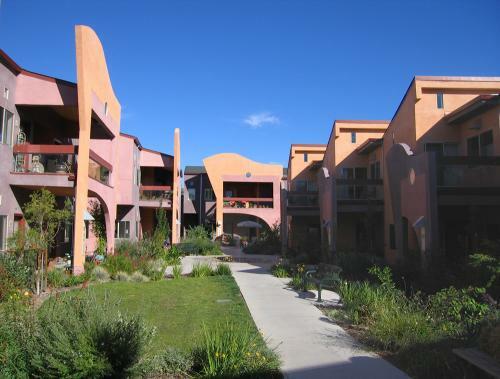 Yulupa Cohousing was designed by architect Michael Black, who designed two other cohousing communities in northern California. This is his most colorful, playful, and innovative design. Our green features include solar panels for the Common House, bike sheds, radiant floor heating, energy efficient windows, and passive cooling from concrete flooring on ground floors. Common areas include a large common house with kitchen, dining room/multipurpose room, kids’ room, laundry room, and library/movie room. Also on the property are a guest room, exercise room and a workshop. A garden area is on site, and people sign up to garden in a plot. We have monthly garden work days and take pride in our many fruit trees, landscaping and gardens. Check our website to view floor plans and to read current member bios, our values statement, and more.